The General Department of Vietnam Customs said that the country gained over 305 million USD from shipping more than 237,000 tonnes of rubber abroad in January-February, up 11.5 percent in value and 27.3 percent in volume from the same time last year. The average rubber price in February stood at 1,322 USD per tonne, jumping 4 percent from the previous month but falling 11.5 percent as compared to the same month in 2018. China remained the largest importer in the period as it splashed out more than 196 million USD on buying 153,190 tonnes of Vietnamese rubber, a year-on-year surge of 35 percent in value and 53.7 percent in quantity. However, the rubber price dropped 12.1 percent year-on-year to 1,279 USD each tonne. The rubber price also slid in India, the second biggest consumer of Vietnamese rubber. Each tonne of rubber was sold at 1,339 USD in the market, a year-on-year fall of 12.14 percent. 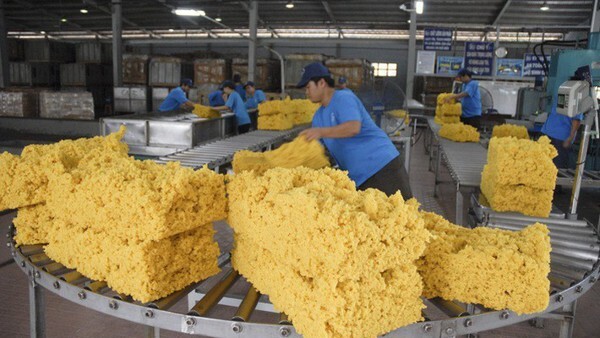 In the two-month period, Vietnam exported 21,100 tonnes of rubber to the southern Asian country and pocketed 28.4 million USD, shooting 42.87 percent in volume and 23.99 percent in value. Shipments to the Republic of Korea inched up 7.7 percent in the period while those to the US and Germany dwindled 6.6 percent and 13.1 percent, respectively.